The standard CSP on Windows XP only supports RSA up to 512-bit, which means that it's the maximum key size I can use for authenticity verification of updates. The public key is embedded in the updater, and the update files are signed with the private key, using SHA256. I know that RSA-768 was factored back in 2010, which is what makes me wonder if RSA-512 is still acceptable for signing purposes. How much effort is it for an attacker to break a 512-bit RSA key? The challenge for RSA-155 (which is 512 bits) was broken in 1999. This took 6 months on pretty advanced hardware to break at the time, which works out to 8000 MIPS years. It should be much less today. FYI, RSA 768 took just under 3 years. Matthew Green: Out of curiosity: do you happen to know offhand how much it costs to factor a 512-bit RSA key on EC2? Tom Ritter: My personal costs are \$120-\$150 with my setup. You can probably do it cheaper, heard reports of \$75. He also published a description of how to factor RSA moduli. The Factoring as a Service project is designed to allow anyone to factor 512-bit integers in as little as four hours using the Amazon EC2 platform for less than $100, with minimal setup. You should be able to just run the scripts from their github. It is not safe at all since Factoring as a service project (https://github.com/eniac/faas) together with Amazon EC2 allows the factorization of a 512-bit key for less than $100 in only a few hours. Considering special purpose hardware, according to  sieving for a 1024-bit RSA modulus can be done in a year for about US \$10,000,000, plus a one-time development cost of about US \$20,000,000, and with a comparable time and cost for the matrix. RSA.816 offers very short-term protection against small organizations Should not be used for confidentiality in new systems. Not the answer you're looking for? Browse other questions tagged rsa signature key-size pki or ask your own question. Is there a truly safe signing algorithm? Is a RSA-signature of some identifying data a safe way to implement a license key? How do digital certificates work, and why is it not possible to reverse engineer one from a signed file? 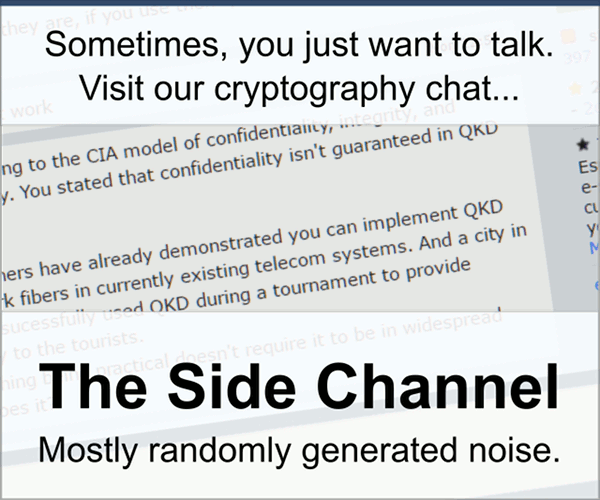 Better security than SHA1 for signature? Signing MD5 hashes with RSA? How many p and q pairs are there in a 1024 bit modulus? How should I incrementally sign a large set of documents? What's the minimum message expansion for Digital Signature?